Ukrainian born biathlete who has been competing for Belarus since 2002. Prior to that, she had competed for the Ukraine from 1991 until she changed her citizenship to Belarus in 2002. Zubrilova has won a total of fourteen Biathlon World Championships medals in her career, including three gold (pursuit, individual, and mass start: all 1999), four silvers (individual: 1997, 2003; sprint: 1997, and pursuit: 1997), and seven bronzes (relay: 1996, 2000, 2001, and 2005; sprint: 1999 annd 2005, and individual: 2001). 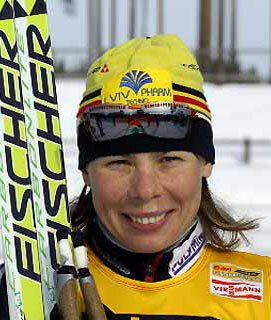 She also competed in three Winter Olympics, her best individual finish was 5th in the 7.5km at Turin in 2006. Zubrilova as of 2006 also has the most victories at the Holmenkollen ski festival's biathlon event with five (1999: individual, sprint, pursuit, and mass start; 2002: pursuit). She also has 21 victories in her career. A divorced mother of one, Zubrilova makes her living as a coach.